The Finsch's Pygmy Parrot nests in termite mounds in trees. The birds excavate a tunnel which slopes upwards into the mound; it is also used as a roosting site. M.f. finschii: Male-mainly green in colour; blue at base of lower mandible; orange/red at centre of abdomen; undertail coverts yellow; green/blue centre tail feathers, tipped in the centre black; lateral tail feathers blue/black. Bill dark grey. Cere and eye ring pink. Eye orange/pink. Female-rose/pink at base of lower mandible; orange/red on abdomen absent; blue/grey cere and eye ring. M.f. aolae: Both adults darker green on upperparts; crown has blue patch; orange/red on abdomen absent in males. M.f. tristami: Both adults as in finschii, but blue on crown absent and orange/red on abdomen absent in males. M.f. nanina: Both adults as in aolae, but with less blue on crown. Smaller in size. M.f. viridifrons: Both adults as in aolae, but with more blue on crown; blue wash on sides of head; orange/red on abdomen in some males. M.f. finschii: As in adults. Bill pale grey. Cere grey. Eye red/brown. Calls are described as moderately loud series of notes, repeated two or three times in a sequence; also various squeaks, shrill notes and soft, whispering chattering. This species may be threatened by logging and habitat degradation. M.f. finschii: Ugi, San Cristobal, and Rennell, S Solomon Islands. M.f. aolae: Guadalcanal, Malaita, Florida, and Russell, C Solomon Islands. M.f. tristami: Vella Lavella, Gizo, Kolombangara, New Georgia, Rubiana, and Rendova, W Solomon Islands. M.f. nanina: Santa Isabel, Bugotu, and Choiseul, N Solomon Islands, and Bougainville Island, E Papua New Guinea. M.f. viridifrons: Lihir and Tabar Islands, New Hanover, and New Ireland, in Bismarck Archipelago, E Papua New Guinea. Found up to 900m (2952 ft) in primary forest, overgrown gardens, casuarinas, secondary growth, open scrubby areas and coconut plantations. 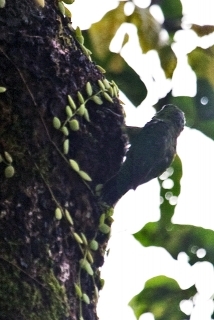 Feeds on lichen, fungi and casuarina seeds. Seen singly, in pairs or in groups of 3-6 individuals. Feeds upside down on lichens and fungi on tree trunks, using its tail as a prop against the bark. 1-2 eggs, 16.5 x 14.5mm (0.65 x 0.6 in).